The hotel is undergoing major restoration works in order to ensure its heritage, which are also in my view a necessity. They start mid February 2017 and last until mid 2018. I am sure this magnificent hotel will be in its full glory after this renovation program. Before covering the usual topics when reviewing a hotel I have to say first a few words to the importance of this flagship property of the Raffles group. The Raffles Singapore is not only a luxury hotel, but an iconic one. This can be claimed without exaggeration. It was first opened in 1887 and it is named after the founder of Singapore. 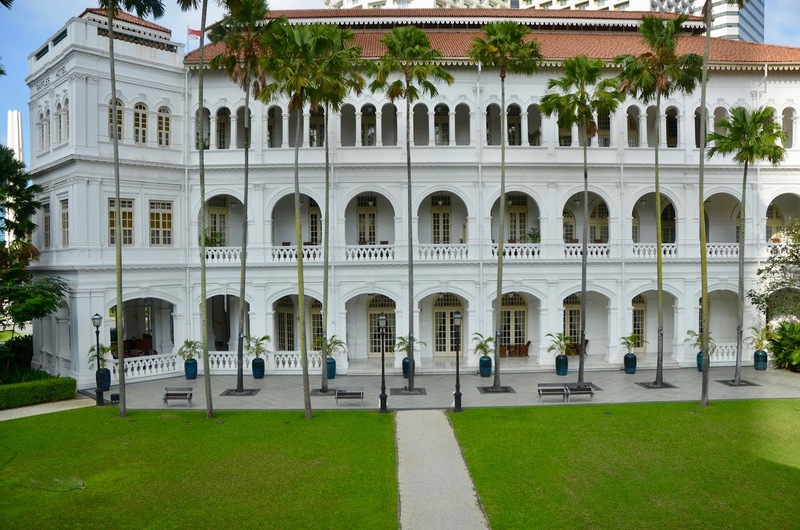 A century later, the Singapore Government declared it a National Monument. Nowadays, no trip to this city is complete without visiting the Raffles, and be it only for a Singapore Sling at its famous Long Bar where this drink was created. The hotel ranks as the perfect blend of luxury, history and colonial design. 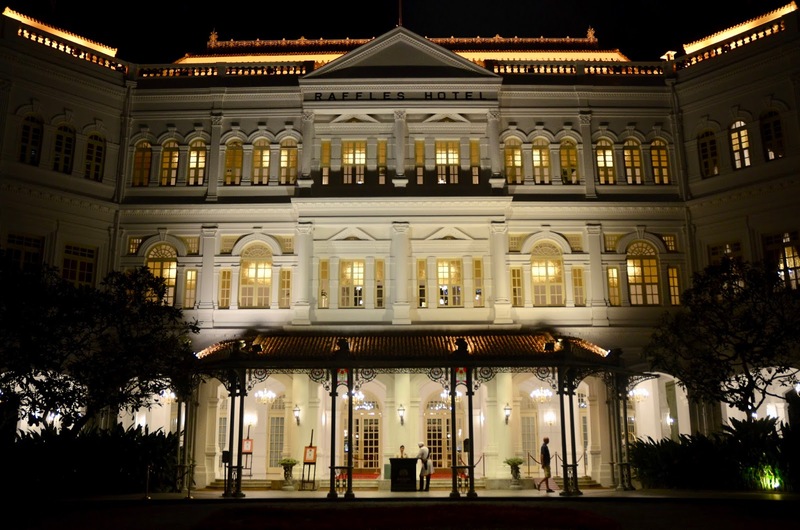 I start with this topic because our arrival at the Raffles left a lasting impression and proved an old saying right: You never get a second chance to make a first impression. When our two families got there after arriving at the airport at 6 AM after a 12-hour flight, we were tired and hoped that there would be a chance to change into lighter clothes at a decent place. Not only was this granted, but we were also invited to a full breakfast by the hospitable German guest relation manager, what a touch! Throughout our stay, this friendly gentleman took care of us, inquiring about our wellbeing or exchanging a few words with us. This was highly appreciated by us! But this was not the only highlight in terms of service. 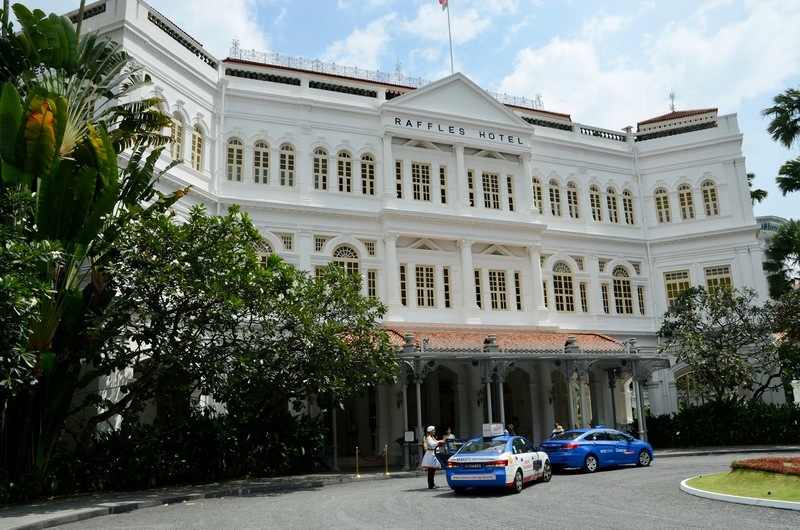 Time and again, we got the feeling that the staff at the Raffles goes the extra mile to achieve guest satisfaction. When the Raffles was opened in 1887 it overlooked the beach, which is hard to believe nowadays! 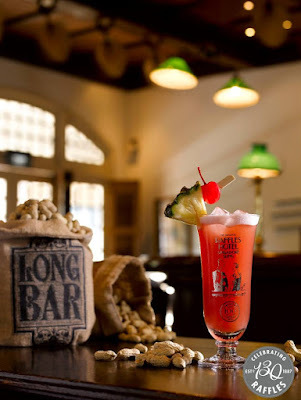 Because today it is surrounded by ultramodern skyscrapers in the heart of the business and civic district about fifteen minutes away by foot from the Marina Bay. It is a small green oasis amidst a vibrant high tech city. It is breathtaking arriving at the main entrance, where liveried Sikh doormen welcome you, entering the lobby, which seems to be unaltered by time, and admiring white marble colonnades around a multi-story atrium. The Raffles is all about old world elegance and charm, felt in almost every spot, so that you get a deep sense of a by-gone-era, beautiful! 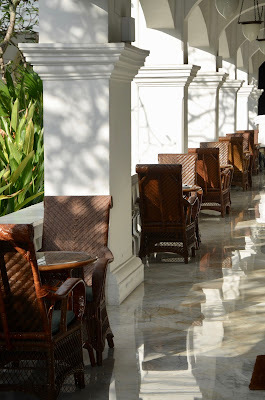 It is such a nice thing to sit on the veranda in front of your room enjoying the view of lush tropical gardens with the colonial buildings in the background. It is a late 1800’ property of a classic colonial architecture. All the furnishings seem to be of this period, although modern conveniences have been added of course. There are a bit more than 100 suites in different categories. In terms of food I can only report on breakfast, as we did not dine at the hotel. Breakfast took place at Tiffin Room and was excellent. There was a great buffet selection and a menu for hot dishes. We usually ordered some eggs and liked what we got. Once we ventured also into the Long Bar, but we were not impressed. 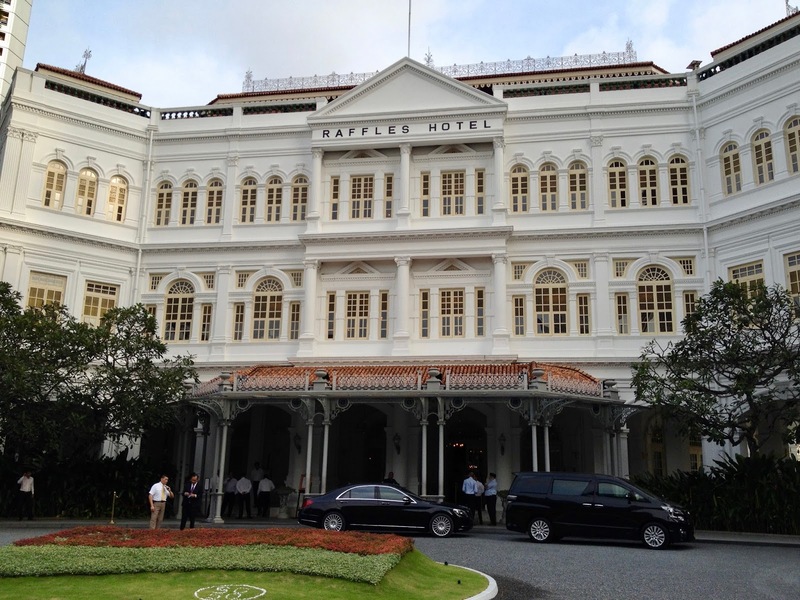 It looks dated and somewhat tatty and of course there are also a lot of tourists being out to catch a glimpse of the famous Raffles. Prices are high as cannot be expected otherwise. 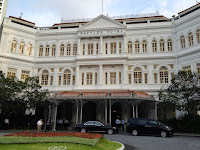 But you are here at the iconic Raffles Singapore and even though it is certainly no bargain you get value for money. Luxury has its price .. 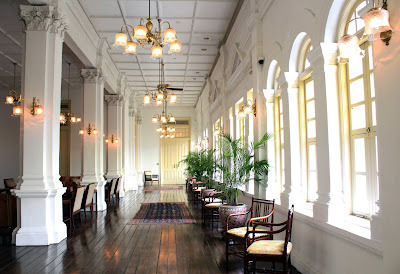 Staying at the Raffles Singapore with its fantastic colonial ambiance is a wonderful experience. The old world charm of this small oasis in the middle of the ultra modern city is captivating. Another plus is the high service level, you feel well looked after by motivated and well-trained staff. The current restoration works will ensure that this grand heritage will be preserved, but also adapted at the present time in some aspects.